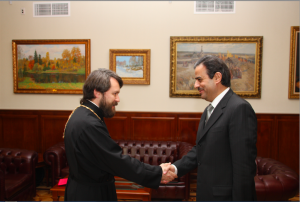 On 20 February 2014, Metropolitan Hilarion of Volokolamsk, chairman of the Moscow Patriarchate’s Department for External Church Relations, met with H.E. Mr. Shawki Bou Nassar, newly appointed Ambassador Extraordinary and Plenipotentiary of the Lebanese Republic to the Russian Federation. Taking part in the meeting were also archpriest Sergiy Zvonarev, DECR secretary for far abroad countries, and Ms. Olga Mazur, a DECR staff member. 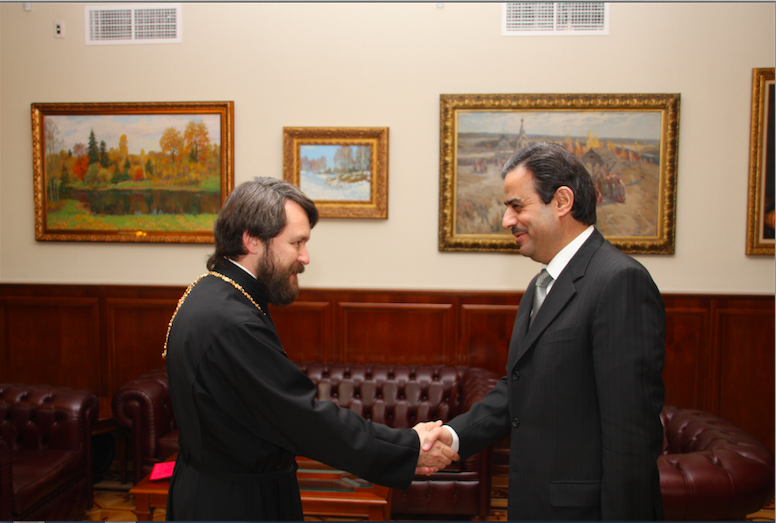 Greeting the guest, Metropolitan Hilarion noted that Lebanon is a unique Middle Eastern country where different ethnic and religious communities live in harmony with each other and where their rights are secured by the Constitution. The DECR chairman also mentioned that the situation of Christians in the region has worsened since the Arab Spring began. He expressed his concern over the situation in Syria, a neigbouring to Lebanon country, where hostilities have been going on for almost three years. Metropolitan Hilarion informed the guest of the position of the Russian Orthodox Church, stated in the address of His Holiness Patriarch Kirill of Moscow and All Russia to the participants in the Geneva II International Conference. In his address, Patriarch Kirill called for the soonest end of hostilities in the Syrian land and for settling the internal political conflicts by peaceful means. The participants in the meeting discussed the problem of refugees who have been pouring into Lebanon from war-stricken Syria.